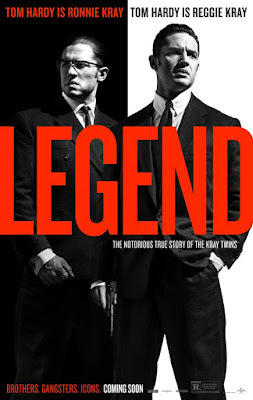 Legend, written and directed by Brian Helgeland, is based off of a true story and is adapted from the book written by author John Pearson. 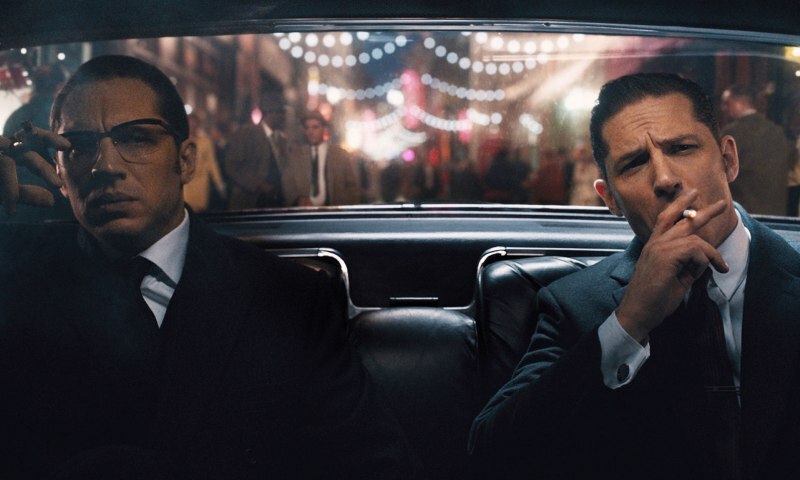 The film features Tom Hardy in a dual role as well as Emily Browning, David Thewlis, Christopher Eccleston, Tara Fitzgerald, Taron Egerton, Adam Fogerty, and Chazz Palminteri. 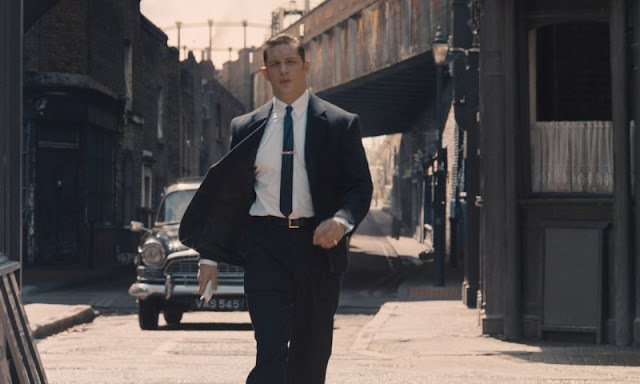 Reggie and Ronald Kray (both parts by Tom Hardy) are identical twin brothers who have become heavyweight players at the organized crime game in 1960's East London. While Reggie focuses on his relationship with the beautiful Frances Shea (Emily Browning), Ronald's desire for more power and wealth eventually leads them to take on even bigger challenges and the dangers that come with them. 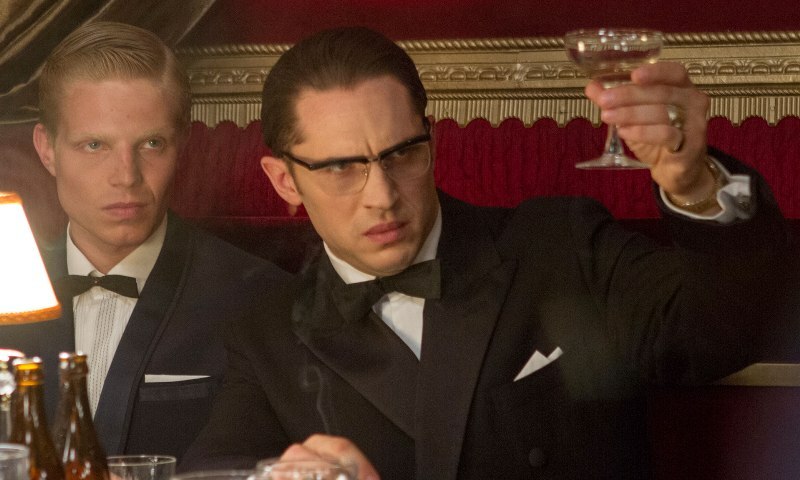 This movie has been highly touted for months as a showcase for Tom Hardy's acting ability as he has taken on the challenge of playing twin brothers who are very different personalities. There are definitely moments in this film where you will just sit back in awe at just how good and versatile Hardy can be, although there are other moments that are honestly kind of laughable although I'm not sure whether that's his error as an actor or the fact that the performances have to be sort of cut and pasted together to get them on screen at the same time. If I were to judge them separately, I would have to say I like Hardy's performance as Reggie way better than as Ronald. As Reggie, he is more believable as a real person with a wide range of emotions and motivations whereas Ronald is sort of a one trick pony that is less satisfying even if it is representative of who the man really was. With his latest film, Helgeland continues to expand on a body of work that includes films like L.A. Confidential, Mystic River, and 42 by crafting a tightly woven tale that stays focused on it's primary characters while covering years worth of story. Visually, the film is beautiful to look at and works very nicely as a period piece. The brothers are about as stylish as you would expect and the 60's era fashion and culture is very well represented. 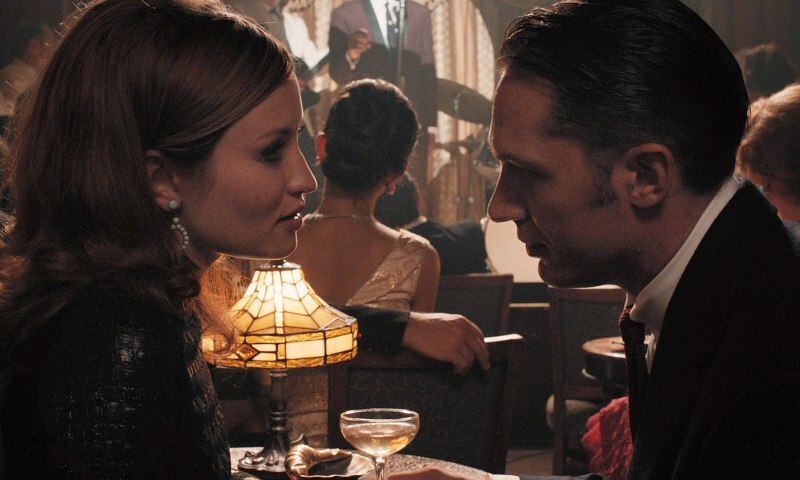 There is one particular scene where Reggie and Frances walk into a nightclub, the cinematography alone seems to transport you back in time and immerses you in their world in much the same way that Scorsese takes you down the rabbit hole during a similar tracking shot in Goodfellas. From this point forward, you know there is no turning back and the journey will not be an easy one, but it will be as glamorous as it is deadly. Tom Hardy proves once again why he is one of the best actors working today although I don't believe he does anything in this movie to actually raise his stature. He is really good and the story is really good but, for a picture that is supposed to be Hardy's stepping stone to greatness, I feel like Legend is a bit of a letdown. Don't get me wrong, this is a really good movie and one I would recommend to most anyone, it just doesn't live up to all the hype and eventually falls just a little flat by the time it's over.